Bolinder's two cylinder Trim outboard engine. An outboard motor is a propulsion system for boats. 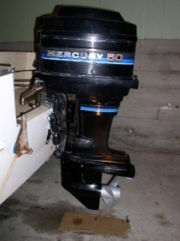 Outboard motors for a boat are developed as a self-contained unit with engine, subsidiary systems, and propeller, designed to be mounted at the stern (rear) of the craft. They are the most common method of propelling small watercraft. As well as providing propulsion, outboards provide steering control, as they are designed to pivot over their mountings and thus control the orientation of the propeller. The transmission leg in the water also acts as a rudder even when the propeller is not providing power. When boats are out of service or being drawn through shallow waters, outboard motors can also be tipped forward over their mounts to elevate the propeller and transmission shaft out of the water to avoid accumulation of seaweed or hitting underwater hazards such as rocks. Small outboard motors are truly self-contained, with integral fuel tanks and controls mounted on the body of the motor and steered by a "tiller" directly connected to the motor. Such small motors can weigh as little as 12 kilograms (approximately 26 pounds) and provide sufficient power to move a small dinghy at around 15 km/h (9 mph), far faster than possible with oars. They are highly portable, able to be removed by simply loosening their mounting clamps. Small outboards usually use a manual pull start ignition system while larger models often have electric start similar to a car. Manufacturers have produced large outboard designs, with sufficient power to be used on boats as long as 9 metres (30 feet) or more. Manufacturers have also produced electric outboards. These are used for specialised applications, notably trolling for bass in the US, where their quietness and zero emissions outweigh the range deficiencies shared with electric cars. Diesel outboards are also available, but their weight and cost makes them impractical for most purposes. 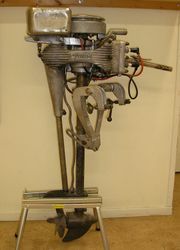 A few outboard motors have been produced with pump-jet propulsion replacing the conventional propeller. Like other types of pump-jet propulsion systems, they offer virtually no cavitation, giving the boat more maneuverability and the ability to operate in very shallow water. However, the low efficiency compared to propellers has seen them restricted to specialized applications. The first practical outboard motor was created by Norwegian-American inventor Ole Evinrude in 1909. Historically, most outboards have used two-stroke cycle engines due to their simplicity (and consequent reliability), low cost, and high power-to-weight ratios - weight issues being particularly important as too much weight over the stern of boats tends to impede their handling. However, the high emissions, and thus both environmental concerns and the cost of technology to meet emissions standards, has led to the gradual gain in popularity of four-stroke cycle outboards, particularly for lower-end machines. High-end outboards have tended to remain two-stroke designs, as the fuel injection technology required to meet the emissions standards and fuel economy targets costs proportionally less for these motors and weight issues are more important. Marine engines also benefit from their proximity to an endless supply of cold water by using it once for cooling and then ejecting the now-heated water. This allows marine engines to avoid the cost and weight of radiators and cooling fans normally associated with land-based engines.